1.Whisk together oil, sugar, and cinnamon. 2.Pour pretzels into a microwave safe bowl and pour oil mixture in. Stir until coated. 3.Microwave for 1 minute, remove and stir. Microwave 45 seconds more. 5.While still warm, sprinkle cinnamon sugar generously. 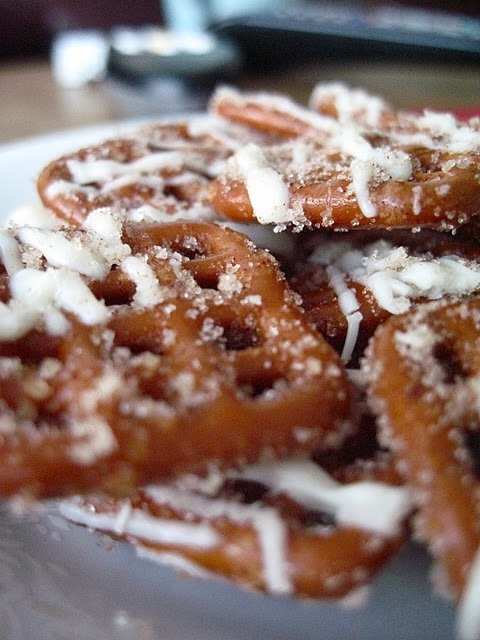 6.Melt white chocolate (on low heat, be careful not to burn) and drizzle over cooled pretzels.